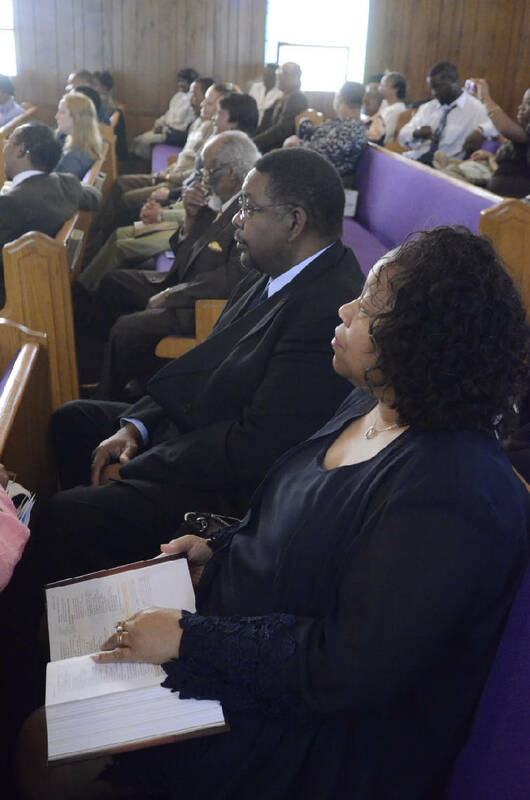 Charles and Angela Moore are among the congregation at St. Paul AME Church. The house where pastor David Strong was beaten and stabbed to death will be put on the market soon, a tough sell in a tough market. The mother of a man accused of killing Strong said she's just trying to cope without her son. And St. Paul AME, the church that Strong led for 10 years, still is healing, its new pastor says. "It's caused a lot of pain, but there is also a healing process because we do believe that God can take care of anything," said the Rev. Kenneth Love, pastor of St. Paul African Methodist Episcopal Church. A year after Strong's slaying, memory of what he meant to the church is still alive, church membership is up and there's renewed emphasis on helping youths, Love said. It's been a difficult time, church members acknowledged, not just because Strong was killed but because of the lurid allegations about homosexuality and drug use that emerged after his death. It was Sunday morning, Oct. 10, 2010, when police found Strong's body in the hallway of his home after questioning a man and a teenager who were found riding in the pastor's PT Cruiser. Charles Moore, St. Paul's Sunday school superintendent, said he was getting dressed for church that morning when he got the call saying that Strong had been murdered. "When I first heard it, I didn't believe it," Moore said. Moore still was mourning the slaying of his youngest son, Darrian LeVon Moore, who was shot and killed during a robbery attempt while sitting in the driveway of his home on July 22. Strong's killing came less than three months later. Moore coped in the same way that many in the church have. The next hearing for two men accused of killing David Strong, cousins Antonio Henry and Brendan Barnes, is scheduled for Oct. 31. Both are asking for separate trials because they will be accusing each other of inflicting the 29 stab wounds that killed the pastor. A trial date could be set in February or March. St. Paul AME Church is at 2514 Williams St. Sunday worship service begins at 11 a.m. For more information, visit http://stpaulamechatt.org. "So what do I do?" asked Moore. "I've got a family. I've got to try to provide stability and guidance. So I just keep going. I may have my times where I fall apart and cry. I just don't let them see it. ... You just have to keep going." On an October youth-day Sunday a year after Strong's death, the sanctuary at St. Paul AME is alive. The red-and-black-attired youth choir sings "Get Ready for Your Miracle" and then "He's Able." Love, sporting a black robe and chest-length, dreadlocked hair with gray streaks, teaches from the book of Habbakuk and admonishes his congregation of about 70 people to remember their own vision for life, to write it down and make it plain. People complain when they focus on present circumstances, he says, but when they remember the overall vision of where they're going, they can rejoice. Love invites the congregation to pray at the altar. Dennis Pratt is first for prayer. Afterward, he walks back to his seat, hands raised and smiling. Those in the congregation who notice, clap and smile with him. Interviewed after the service, Love said there's been no mass exodus from St. Paul because of Strong's death. In fact, the church has gained 23 members, he said. He is continuing the programs Strong implemented or led, such as the Daughters of Darcus in which young women and girls participate in community service projects targeting seniors and children, and the Nehemiah Nation, where men in the church help with community- or church-building projects. Love, whose father is a former pastor of the same church, said he's been leading St. Paul AME to focus on the community, to mentor students attending Howard School of Academics and Technology and Calvin Donaldson Elementary School. Within the past year, the church has added Internet services for use by community members, restarted its youth mentoring program and begun transportation services to get people to church. And the congregation -- which includes 96-year-old Dorothy Cooper, who gained national attention after not being allowed to get a voter ID card from the state before finally receiving one Thursday -- will start a voter registration drive in November targeting the elderly. The church also will offer transportation to the polls. The red-brick Glenwood Drive parsonage where Strong was beaten and stabbed 29 times soon will be put up for sale, church officials said. From now on, the pastor at St. Paul AME will be given a housing allowance instead. The doorbell at 404 Glenwood still works, a TV satellite dish sits on the roof and the lawn has been maintained. A Jehovah's Witness magazine is tucked inside the black iron scrollwork on the front door and a phone book wrapped in a yellow plastic bag lies on the porch. Inside the house is where murder defendant Antonio Henry said during a jailhouse interview that he beat Strong after the pastor made unwanted sexual advances toward him. Henry claimed that they all smoked marijuana and ate pizza together. Henry also said Strong had taken him and the other suspect, his 17-year-old cousin Brendan Barnes, back to his home to perform sexual acts and would not allow them to leave when they refused. Sixteen-year-old Brendan Barnes, left, and his cousin Antonio Henry, 25, are charged in the death of Rev. David Strong. Subsequently, alcohol and THC -- marijuana's active ingredient -- were found in the pastor's system during an autopsy, records show. Anita Burgis, mother of the now 26-year-old Henry, said the biggest change for her over the past year is experiencing life without her son. "My son is locked up," she said. "It's put a strain on the whole family. I'm trying to keep my mom from having a nervous breakdown." She also said she also has more distrust for people who say they are of God. Love said the church makes no comment about Strong's private life. He said he only knew Strong to be a hard-working pastor who loved his congregation and community. "You don't make statements on things that are not," said Love. "We know Rev. Strong to be a strong preacher in the community. That's all we do know, and we proclaim that very strongly."